(Nanowerk News) Galaxies come in three main shapes - elliptical, spiral (such as the Milky Way) and irregular. They can be massive or small. To add to this mix, galaxies can also be blue or red. 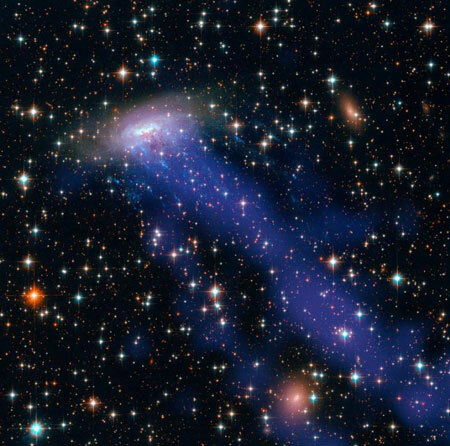 Blue galaxies are still actively forming stars. Red ones mostly are not currently forming stars, and are considered passive. The processes that cause galaxies to "quench," that is, cease star formation, are not well understood, however, and constitute an outstanding problem in the study of the evolution of galaxies. Now, using a large sample of around 70,000 galaxies, a team of researchers led by University of California, Riverside astronomers Behnam Darvish and Bahram Mobasher may have an explanation for why galaxies stop creating stars. "By using the observable properties of the galaxies and sophisticated statistical methods, we show that, on average, external processes are only relevant to quenching galaxies during the last eight billion years," said Darvish, a former graduate student in the UC Riverside Department of Physics and Astronomy and the first author of the research paper that appears today in The Astrophysical Journal ("Effects of Local Environment and Stellar Mass on Galaxy Quenching out to z~3"). "On the other hand, internal processes are the dominant mechanism for shutting off star-formation before this time, and closer to the beginning of the universe." "The situation becomes more complex when we realize that all these mechanisms may depend on properties of galaxies being quenched, they may evolve with time, they act at different time-scales - fast or slow - and they may depend on the properties of the quenching factors as well," Darvish said. Mobasher, a professor of physics and astronomy who supervised Darvish during the course of the research, said, "We found that on average the external processes act in a relatively short time-scale, around one billion years, and can more efficiently quench galaxies that are more massive. Internal effects are more efficient in dense clusters of galaxies. The time-scale is very important. A short time-scale suggests that we need to look for external physical processes that are fast in quenching. Another important result of the work is that internal and external processes do not act independently of each other in shutting-off the star formation."